The internet has permanently changed the way society consumes information and advertising. It’s also confusing and overstimulating, so journalists like Dan Kennedy, a professor at the Northeastern University’s School of Journalism, are analyzing ways in which society and the news media are adapting. Kennedy spoke at Pizza, Press & Politics, the School of Journalism’s lunchtime speaker series on Jan. 30. The internet is changing long-established ways of consuming information. Human brains have become accustomed to longform reading, said Kennedy. These habits are losing their importance, however, as the internet encourages multitasking and skimming. The internet has also changed advertising, as companies shift from newspapers and TV to other online platforms, such as Google and Facebook, said Kennedy, whose talk was adapted from his most recent book, “The Return of the Moguls.” The emergence of Craigslist, which provided a mostly free platform for classified ads, caused media companies to scramble for new forms of ad revenue. News sites did find new ways to make ads more visible — and obnoxious — for the sake of increasing the revenue from views and clicks, he said. The problem with this strategy is that these ads further distract readers and contribute to the diminishing ability to process longform news. 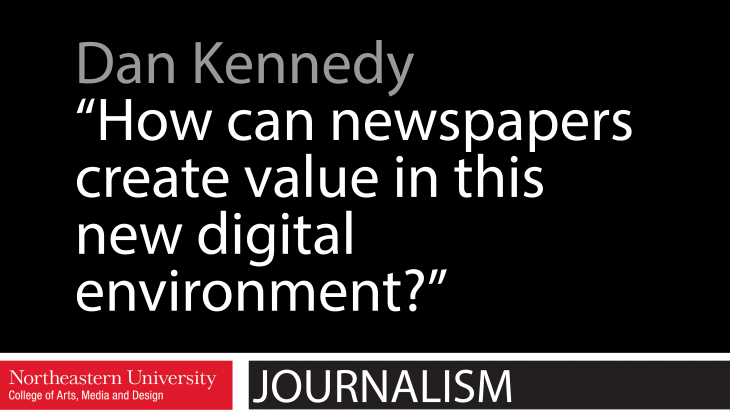 Kennedy remains optimistic about the future of news, however, as major news sites are developing new business models. News sites are increasingly looking at readers as a source of revenue, said Kennedy. For instance, email newsletters have emerged as a way of bringing important stories to the reader’s inbox. That helps encourage them to subscribe. It also reduces reader’s reliance on social media platforms, like Facebook. Kennedy also believes that millenials are less opposed to subscribing to the news than older generations. They understand that things on the internet are not always free, because they use pay services such as Spotify and Netflix. “We’re not going to go back to where we were before,” said Kennedy, referring to the early days of digital news when online papers were free. Media outlets are also re-thinking their advertising strategies, using new ad metrics such as monitoring the time spent on a webpage, the number of tabs open, and the amount of scrolling. These metrics provide better data to show companies, which are looking to advertise, he said. Data on customer engagement allows news sites to include advertisements on their web pages that generate more revenue and do not disturb the reader with flashy pop-ups. Kennedy believes that news should be consumed in a format that is the least distracting. This task is important for both media outlets and consumers. News sites must find interesting ways to present longform news to keep the reader engaged, and readers should be mindful of how they interact with the news online.